When you check the thermometer in your home, you see that there’s a moderate temperature. However, the moment you step out of your home, the heat becomes unbearable! Why is this so? Why is there a huge difference between the apparent temperature and the real temperature? This may be because of the heat index which, in the situation we’ve discussed, may be particularly high. 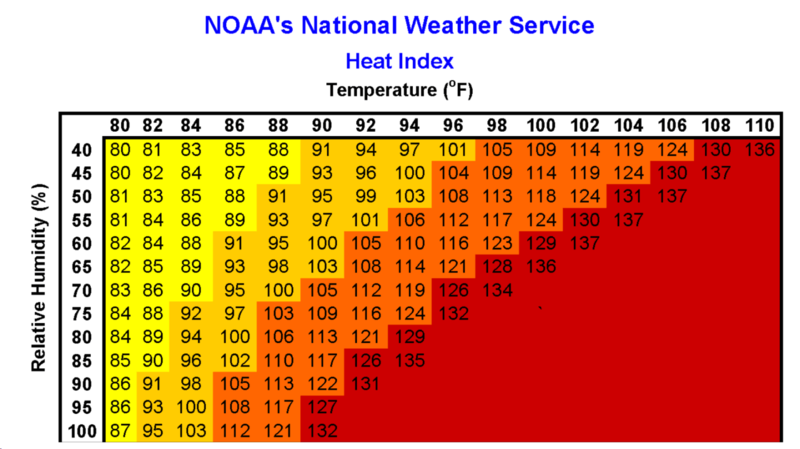 To calculate heat index, use this heat index calculator. How to use the heat index calculator? How do you calculate the heat index? How is feel like temperature calculated? First, enter the value for the Temperature then choose the unit of measurement from the drop-down menu. Then enter the value for the Relative Humidity in percentage. After entering both values, the heat index calculator will automatically provide you with the Heat Index. The National Weather Service or NWS in America makes use of the heat index just like the wind chill temperature index. The basis of this index is a number of assumptions such as the wind speed, the person’s blood thickness, clothing, height, body mass, and the physical activity of each person. Therefore, depending on how much these assumptions differ from an individual’s reality, the heat index estimate might not show the perceived temperature accurately. The NWS uses a specific equation to calculate heat index or at least estimate it. Back in 1978, George Winterling developed this equation which, according to him, is only meant for temperatures 80°F and above and a relative humidity of 40% and above. We humans perceive temperature as a result of wind speed, relative humidity, and the temperature of the air. Sometimes, we can refer to this as the apparent temperature, and it may affect us medically in a potentially severe way. If the heat index calculator shows a high value, you might not perspire properly because of the high humidity which, in turn, reduces perspiration. This can be very dangerous because sweat is the physiological response of our body when the temperature is high. We sweat because our body tries to lower its temperature through sweat evaporation. So if you can’t sweat properly, you might experience dehydration or overheating. When you expose yourself to direct sunlight, this may increase the values of the heat index by as much as 14°F. Take note of this, especially when it comes to children. Younger children have more of a risk when the heat index is very high because they have a larger surface of the skin in relation to their smaller bodies. This means that they may produce more heat, especially when they move around a lot. Also, children don’t sweat as much as adults, and they don’t have the awareness when they need to re-hydrate or rest. So, you want to keep your children safe, you may want to keep on checking the heat index using the heat index calculator. If you discover that there’s a high heat index, look out for signs of dehydration in yourself and in your children. Make sure you’re well-hydrated, especially after you’ve spent time outdoors or if you’ve been playing or exercising with your children. Those who have certain medical conditions should also keep track of the heat index. Some examples of those conditions include heart disease, obesity, cystic fibrosis, diabetes, and more. The heat index is also known as the “felt air temperature” or the humidex. This index takes into account the humidity and the air temperature giving as a more accurate description of how hot it feels. Moist air would feel a lot hotter because it blocks the evaporation of sweat which is our body’s cooling mechanism. HI = -42.379 + 2.04901523_F + 10.14333127_H – 0.22475541_F_H – 6.83783_10^-3_F^2 – 5.481717_10^-2_H^2+1.22874_10^-3_F^2_H + 8.5282_10^-4_F_H^2 – 1.99_10^-6_F^2*H^2. A lot of people won’t even bother using this formula because it’s confusing. If you’re one of those people, the best thing to do is to use this simple online tool instead. The temperatures we see on our thermometers only represent the air’s temperature, but they don’t consider how we as humans experience this temperature. It’s the “feels like” temperature which would give you a better idea of how it would feel like when you go outside. The “feels like” temperature considers the humidity and the wind speeds. It evaluated how our bodies would feel the temperature in reality. But how do we calculate this temperature? To do this, you need to take into account the relative humidity, the expected temperature of the air, and the wind’s strength at about 5-feet which is the average height of where the human face is. Combine this with how we understand how our bodies lose heat during windy or cold days. During windy days, the moisture evaporation from our skin becomes faster thus, moving the heat away from our bodies. Because of this, we feel colder than the weather actually is. However, this rule doesn’t apply when it comes to higher temperatures. In such conditions, the wind chill isn’t considered significant, but humidity plays a huge role. On days with high humidity, we would feel hotter because we aren’t able to sweat as much as we should.